Neo-futurism is a late 20th to early 21st century movement in the arts, design, and architecture. It could be seen as a departure from the attitude of post-modernism and represents an idealistic belief in a better future and "a need to periodize the modern rapport with the technological". 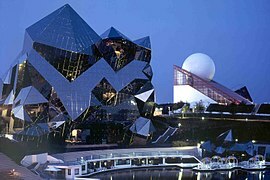 This avant-garde movement is a futuristic rethinking of the aesthetic and functionality of rapidly growing cities. The industrialization that began worldwide following the end of the Second World War gave wind to new streams of thought in life, art and architecture, leading to post-modernism, neo-modernism and then neo-futurism. 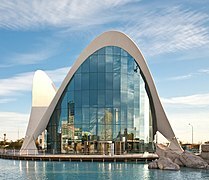 In the Western countries, futurist architecture evolved into Art Deco, the Googie movement and high-tech architecture, and most recently into neo-futurism. 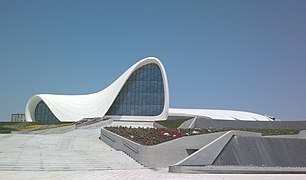 Pioneered in the late 1960s and early 70s by American architects Buckminster Fuller and John C. Portman, Jr.; Finnish-American architect and industrial designer Eero Saarinen, Archigram, a British avant-garde architectural group (Peter Cook, Warren Chalk, Ron Herron, Dennis Crompton, Michael Webb and David Greene) based at the Architectural Association, London; American avant-garde architectural group ArchiGO, centered around the Illinois Institute of Technology; Danish architect Henning Larsen; Czech architect Jan Kaplický; Italian light sculptor Marco Lodola; American concept artist Syd Mead; American theatre screenwriter Greg Allen and Russian poets Andrei Voznesensky, Serge Segay and Rea Nikonova. Although it was never built, the Fun Palace (1961) interpreted by architect Cedric Price as a "giant neo-futurist machine" influenced other architects, notably Richard Rogers and Renzo Piano, whose Pompidou Centre extended many of Price's ideas. Neo-futurism was relaunched in 2007 after the dissemination of "The Neo-Futuristic City Manifesto" included in the candidature presented to the Bureau International des Expositions (BIE) and written by innovation designer Vito Di Bari, a former executive director at UNESCO), to outline his vision for the city of Milan at the time of the Universal Expo 2015. Di Bari defined his neo-futuristic vision as the "cross-pollination of art, cutting edge technologies and ethical values combined to create a pervasively higher quality of life"; he referenced the Fourth Pillar of Sustainable Development Theory and reported that the name had been inspired by the United Nations report Our Common Future. Jean-Louis Cohen has defined neo-futurism as "a corollary to technology, being the structures built today byproducts of new materials to create previously impossible forms." Etan J. Ilfeld wrote that in the contemporary neo-futurist aesthetics "the machine becomes an integral element of the creative process itself, and generates the emergence of artistic modes that would have been impossible prior to computer technology." 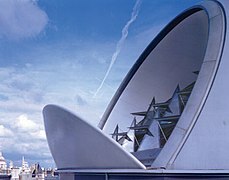 Reyner Banham's definition of "une architecture autre" is a call for an architecture that technologically overcomes all previous architectures but possessing an expressive form, as Banham stated about neo-futuristic "Archigram’s Plug-in Computerized City, form does not have to follow function into oblivion." 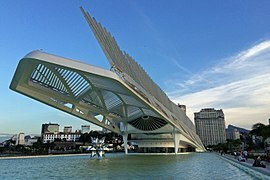 Inspired by Futurist architect Antonio Sant'Elia and pioneered from early 1960s and late 1970s by thought leader Hal Foster, French architect Denis Laming, American architects William Pereira and Charles Luckman and Danish architects Henning Larsen and Jørn Utzon. The neo-futurist avant-garde movement has been relaunched in 2007 by Expo 2015 Innovation Designer Vito Di Bari. 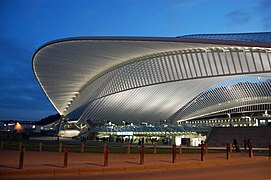 Neo-Futurist architecture and art have been creatively inspired by Iraqi-British Pritzker Prize architect Zaha Hadid, and Spanish architect Santiago Calatrava; Indian sculptor Anish Kapoor and Dutch kinetic sculptor Theo Jansen. Italian Innovation Designer Vito Di Bari is considered the thought leader of the movement, his vision of the “cross-pollination of art and technology for a better world” has been defined by Steve Jobs as the "post-PC DNA" and it is shared by acclaimed architects, designers and artists such as the youngest recipient ever of the Pritzker Prize Japanese architect Ryue Nishizawa, architect of Ecoville in Curitiba and of the first rotating residential buildings Bruno de Franco, Design for Asia Award 2004-7-9 recipient Hong Kong Architect Gary Chang, Brazilian architect Rodrigo Ohtake, Lubetkin Prize Winner British designer Thomas Heatherwick, Design for Asia 2008 Award recipient Japanese artist Tokujin Yoshioka, Italian artist Mario Arlati, Polish artist Karina Smigla-Bobinski. 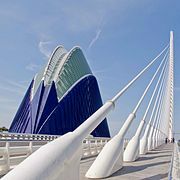 The relaunch of neo-futurism in the 21st century has been creatively inspired by the Iraqi-British Pritzker Architecture Prize-winning architect Zaha Hadid, Spanish architect Santiago Calatrava  and by Vito DiBari. Neo-futurist architects, designers and artists are French architect Denis Laming [fr]; American artists Josh Hadar, Erin Sparler, Marlow Rodale, Panayiotis Terzis, and Miguel Ovalle; urban-noise artist Joseph Young; French designer Patrick Jouin British artist Olivia Peake; Japanese designer Yuima Nakazato, Swedish artist Simon Stålenhag, and Greek artist Charis Tsevis. Neo-futurism has absorbed some of the high-tech architecture’s themes and ideas, incorporating elements of high-tech industry and technology іnto building design: technology and context is the focus of some architects of this movement such as Buckminster Fuller, Norman Foster, Kenzo Tange, Renzo Piano, Richard Rogers, Frei Otto, and Santiago Calatrava. ^ a b Jacob R. "Architecture 350 > Campagnol > Flashcards > Arch 350 - Exam 4 - StudyBlue". StudyBlue. Retrieved 22 October 2014. ^ Kristi York Wooten. "How 1980s Atlanta Became the Backdrop for the Future". The Atlantic. ^ "John portman News, Videos, Reviews and Gossip - io9". io9. ^ "Silver Screen: Meet John Portman, the Architect Behind the Dystopian Backdrops of The Walking Dead and The Hunger Games". Yahoo News. 6 April 2015. ^ "Version 14: Event: ArchiGO: 50 Years Later « co-prosperity sphere". Coprosperity.org. Archived from the original on October 22, 2014. Retrieved 22 October 2014. ^ ""Jan Kaplický" Video - Buildings and Interviews". OVGuide. ^ "Interview with Alex Cigale: Part II". asymptotejournal.com. ^ Erskine Design. "Frieze Magazine - Archive - The Enclosure Business". Frieze.com. Archived from the original on October 22, 2014. Retrieved 22 October 2014. ^ "BIE - Bureau International des Expositions". bie-paris.org. ^ "MoreArtCulture Messenger: Vito Di Bari on Wednesday and Your Week in Arts + Culture". constantcontact.com. ^ "Neofuturism Architecture And Technology, SCI-Arc Media Archive". Sma.sciarc.edu. 1987-10-05. Retrieved 2014-01-17. ^ "New York Architecture Images-". 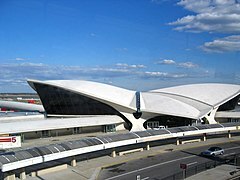 www.nyc-architecture.com. ^ Cake, Opera (19 October 2010). "Neo-Futurism at Danish Royal Opera". ^ "Sydney Opera House, Sydney - SkyscraperPage.com". skyscraperpage.com. 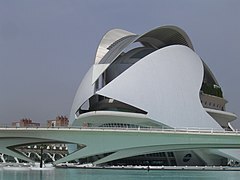 ^ "futuristic architecture, santiago calatrava, future architecture, modern building, white interior". indulgy.com. ^ "Clashot: earn money taking photos with your phone". clashot.com. 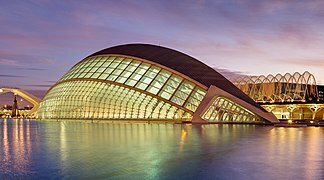 ^ "Futurism and Santiago Calatrava". prezi.com. ^ "Three futuristic views inside Anish Kapoor at the Grand Palais". ^ TEDx Talks (11 February 2014). "The art reef project: Vito Di Bari at TEDxMarrakesh" – via YouTube. ^ "Cross-Pollination the Steve Jobs' Way | Pat's Blog". Patriciaharmon.wordpress.com. 2011-10-19. Retrieved 2014-01-17. ^ "THE NEW FUTURISM | Confessions of a Digital Adman". Digitaladman.com. 2009-06-29. Retrieved 2014-01-17. ^ "Neo-Futurism in the Information Age | Technology Treason". Ajfisher.me. 2011-10-17. Retrieved 2014-01-17. ^ "AweSomeness ..." Shifhana.blogspot.it. Retrieved 22 October 2014. 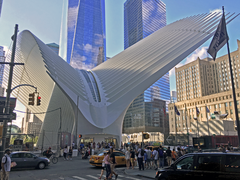 ^ a b "Santiago Calatrava". Mediander. Retrieved 22 October 2014. ^ Lino Bianco. "LECTURE 10: NEOMODERN AND NEOFUTURIST ARCHITECTURE". academia.edu. ^ "Vito di Bari: The Internet of Things". Financial Times - Reshaping ICT. Archived from the original on 7 November 2014. ^ "Denis Laming Architectes". laming.fr. ^ Nicola Williams; Virginie Boone (2002). The Loire. Lonely Planet. pp. 47–. ISBN 978-1-86450-358-6. ^ Paul Caridad. "Neofuturistic Vectors and Vibrant Mosaics". Visual News. ^ "Tokyo". Triposo.com. Archived from the original on August 18, 2014. Retrieved 22 October 2014. 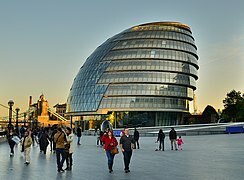 ^ "Lord Norman Foster". Encyclopædia Britannica. Retrieved 22 October 2014. Cohen, Jean-Louis (2012). The Future of Architecture. Since 1889. London: Phaidon Press. ISBN 978-0714845982. Foster, Hal (1987). 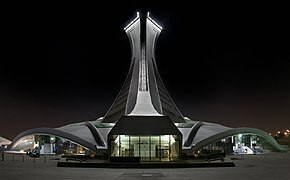 "Neo-Futurism: Architecture and Technology". AA Files. Architectural Association School of Architecture. 14: 25–27. JSTOR 29543561. Foster, Hal (1994). "What's Neo about the Neo-Avant-Garde?". October. MIT Press. 70: 5–32. JSTOR 779051. Klein, Caroline; Lieb, Stefanie (2013). Futuristic: Visions of Future Living. Cologne: DAAB Media. ISBN 978-3942597098. This page was last edited on 1 March 2019, at 10:00 (UTC).